There was much discussion in the Press Room why the Press has no direct access to the Conference Chamber when Delegations meet for "Informal meetings". You would also talk to the public first when you settle "family affairs". Delegates also meet in PrepComms, in Summits and a lot of Conferences, sometimes in my view too much conference hopping, too little checking meanings and contexts, and then subsuming and resonating. The Climate Kitchen is still brewing, some people announce and other try to halt, very special time here in prepCom for the Climate Talks in Doha. After our minister Altmeier, the Deputy Primeminister from is on-air, later the climate embassador from South-Africa. 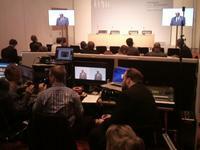 later our Chancellor Mrs Merkel These opening statements of keynotes ar video-streamed. His Excellency Abdulla bin Hamad Al-Attiya requested and annoucned open and constructive discussion, but in Chatenham House "style" - which they interprete aas closed, and not that the exchanges will be kept intern and and no citations, excepts when explicitely stated. So nobody can come to the kitchen to the restaurant through the back door !! But the inter ...... WORK IN PROGRESS.. 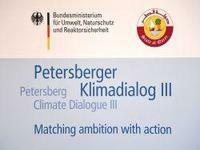 The third Petersberg Climate Dialogue entitled Matching Ambition with Action will take place in Berlin from 16 to 17 July 2012. Co-chairs Germany and Qatar (Presidency of the upcoming UN Climate Change Summit in Doha) invited ministers from 35 countries representing the various groups at international climate negotiations. This meeting of ministers several months before the UN climate negotiations in Doha in winter of this year will provide a realistic picture and a political development path for the conference in Doha and beyond. 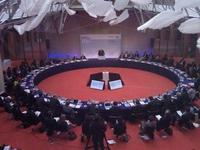 •	the new climate treaty to be negotiated by 2015 and implemented from 2020. The Petersberg Climate Dialogue began life in Copenhagen as a personal initiative of Federal Chancellor Angela Merkel and has since been used as a forum to build bridges in international climate negotiations. In particular it aims to bridge the gap between implementation and negotiation so that climate negotiations can be backed and supported by experience gained in the implementation of climate policy measures.